I hope you are enjoying the heatwave currently covering the UK. I do not really enjoy this kind of heat but I stay in the shade and make sure I take water with me when I go out. 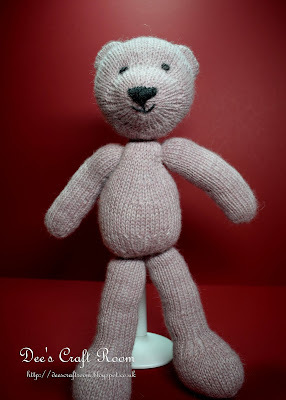 It's time to share another of my knitting projects from last year, this little bear was a gift for a very dear friend. 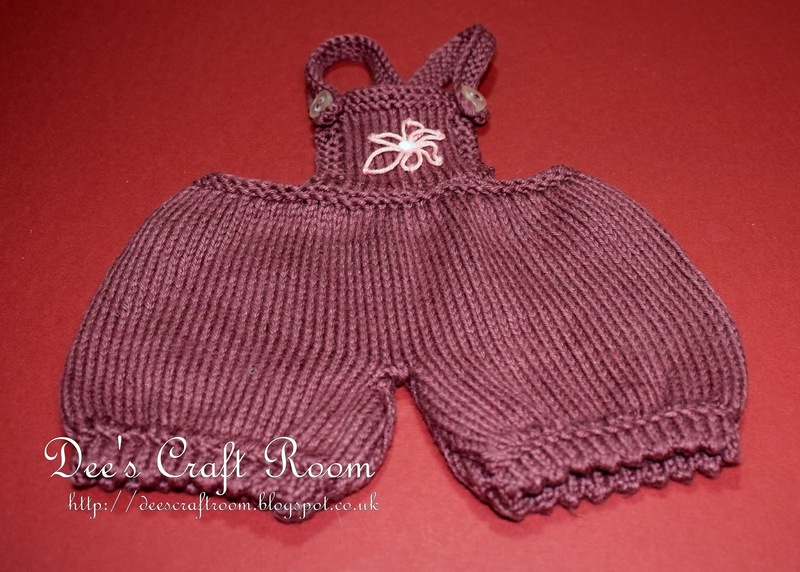 This is another pattern from Susan Hickson and Mary Jane's Tearoom, which you can buy on-line from Ravelry. The pattern is called 'Candy' and this is the second time I have made it - so if it looks familiar that would be because you probably saw it a few weeks ago. As you can see, I went for a different colour scheme this time. 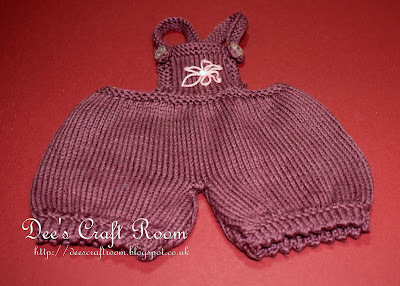 whilst the dungarees are an aubergine with a lazy daisy motif made with the same salmon pink and white. It also has sweet heart shaped buttons. 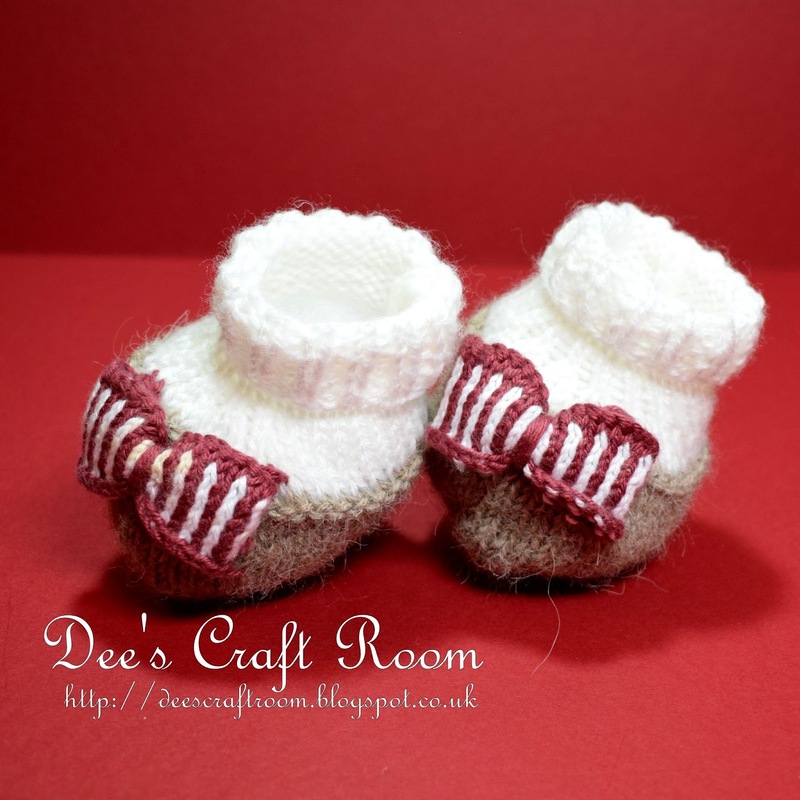 The slippers and socks are made in one piece of DK yarn and they have aubergine and white striped cotton bows. 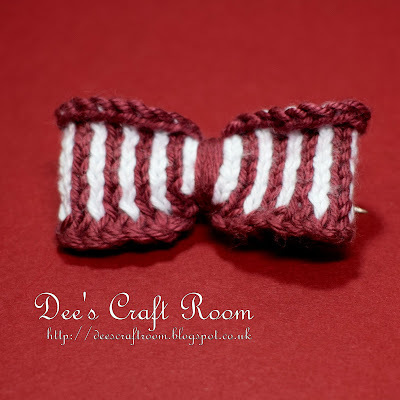 I made a third stripped bow, which I converted into a 'hairslide' using a small brooch pin. 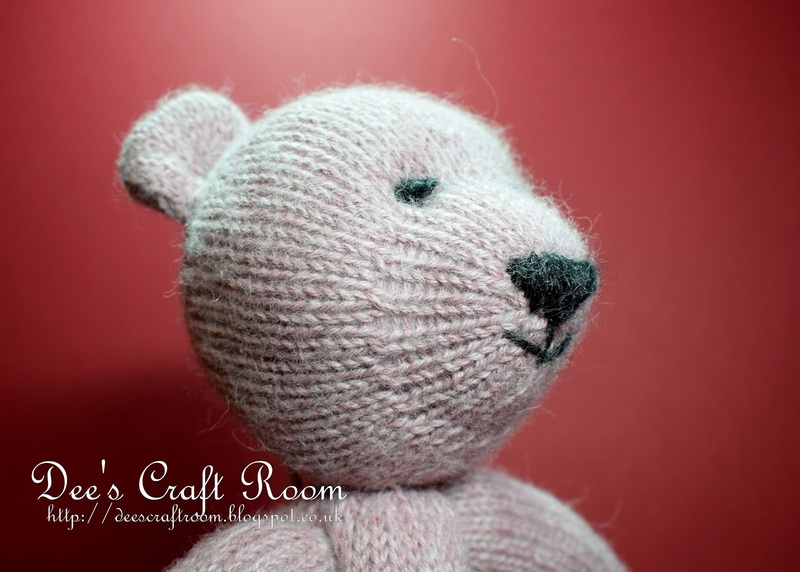 The bear is made of a dusky pink DK alpaca wool. The features are stitched on with black alpaca wool. You have to stitch the features before you attach the head to the body. Unfortunately, once I stitched the head in place, her ears seem a little too far back. However, I did such a good job of attaching the ears that, despite several attempts, I was unable to unpick them. 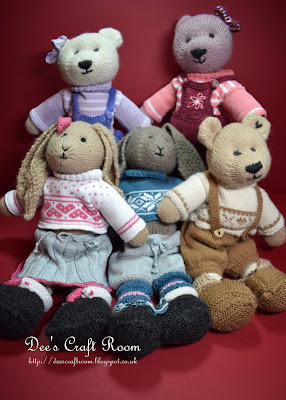 Here is a photo of some of the Mary Jane Tearoom animals I have made, I just adore these patterns, they are so cute. You can probably spot the two 'Candy's' sitting side by side at the back, with Anaka, Bo and Romeo from left to right in the front row. My little family has grown again recently but I have not had time to photograph the new members yet. Have a great week and make the most of the good weather whilst it lasts. Thank you Carol. My friend named Daisy, I think she took her name from the lazy daisy on the bib of her dungarees. However, these Mary Jane's Tearoom patterns come complete with all of the clothes and a name, this is the 'Candy' pattern. 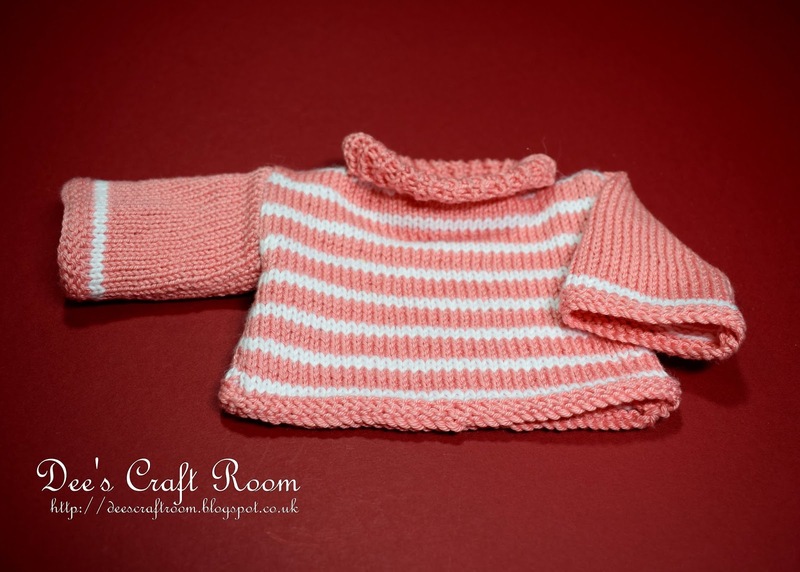 They are such a joy to make, although my alpaca DK is finer than normal DK, so I have a bit of trouble down-sizing the clothes so they fit. I am so glad I was able to find some time for a visit today because this little gal is absolutely heartwarming! The bow on her ear and the bows are her shoes are so precious! 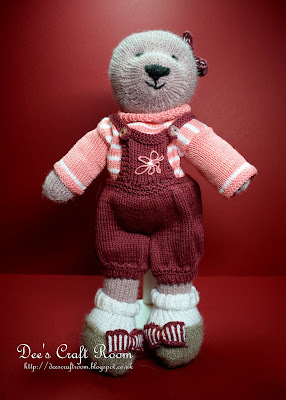 What a sweet little outfit, I adore your animals friends Dee! It's been quite the busy summer for me so far. I've had a baby Sparrow, a baby Grackle, a baby raccoon, two injured squirrels, a family of sick red squirrels and the last of the hawk attack victims!! I'm almost thankful for the sweltering heat outside, makes me feel like I'm not missing much when I'm stuck in the house all day. lol. The patio does make a great place to spend 5 minutes when I have it though! I do hope you have been enjoying your summer and having nice weather. Sending hugs and wishes your way! Hi Pamellia. Thank you so much for your lovely comments. For some unknown reason I have stopped recieving email alerts when when someone leaves a comment on my blog, so I almost missed this. We are also 'enjoying' a heatwave and this week there is talk of temperatures topping 35 degrees and breaking all records. All the plantlife is dying and ponds and small rivers are drying up. I am not a fan of this type of heat and tend to hide in the shade. It even makes knitting difficult as damp sweaty hands makes the yarn sticks to my fingers. Thank goodness there are people like you helping the wildlife, I hate to think what would happen without you. Aw, this is so kind of you Carol. I am fine, I have been knitting like a mad woman trying to get on top of the Christmas gifts I want to make for family and friends.